Drone swarm technology—the ability of drones to autonomously make decisions based on shared information—has the potential to revolutionize the dynamics of conflict. And we’re inching ever closer to seeing this potential unleashed. In fact, swarms will have significant applications to almost every area of national and homeland security. Swarms of drones could search the oceans for adversary submarines. Drones could disperse over large areas to identify and eliminate hostile surface-to-air missiles and other air defenses. Drone swarms could potentially even serve as novel missile defenses, blocking incoming hypersonic missiles. On the homeland security front, security swarms equipped with chemical, biological, radiological, and nuclear (CBRN) detectors, facial recognition, anti-drone weapons, and other capabilities offer defenses against a range of threats. But while drones swarms represent a major technological advancement, unlocking their full potential will require developing capabilities centered around four key areas: swarm size, customization, diversity, and hardening. In general, the more drones in a swarm, the more capable the swarm. Larger underwater swarms can cover greater distances in the search for adversary submarines or surface vessels. Larger swarms can better survive some defenses. The loss of a dozen drones would significantly degrade the capabilities of a twenty-drone swarm, but would be insignificant to a thousand-drone swarm. Media reports indicate that China has successfully tested a swarm of one thousand drones. And China appears to be interested in swarm capability as a method of attacking US aircraft carriers. Although Intel has fielded a swarm of 1,218 drones, this does not appear to be a true drone swarm, relying on programmed behaviors instead of inter-drone communication. There is little reason to believe swarm size could not continue growing significantly. Building a large swarm primarily requires the ability to handle massive amounts of information. More drones mean more inputs that could affect the swarm’s behavior and decisions. And on a basic level, more drones mean a greater risk of one drone crashing into another. Of course, the importance of swarm size will depend on the mission. Stealthier missions against softer targets do not require thousands of drones. And large numbers of drones could be detrimental, drawing unnecessary attention from defenders. But massive attacks on adversary bases and other hard targets might need exactly that. An attack on a hardened target means greater expectation of loss and greater need to mass offensive power. A future drone swarm need not consist of the same type and size of drones, but incorporate both large and small drones equipped with different payloads. Joining a diverse set of drones creates a whole that is more capable than the individual parts. A single drone swarm could even operate across domain, with undersea and surface drones or ground and aerial drones coordinating their actions. Current drone swarms consist primarily of small, identical, sensor drones, but simple multi-domain swarms have already been developed. One such swarm involves a flying drone collaborating with a walking drone. The aerial drone maps the nearby area and the ground-based drone uses that information to plan its actions. Another experiment demonstrated a swarm of five differently sized ground drones, each equipped with different sensors and different functions. The five drones work together to carry out a basic human rescue mission, transporting a dummy to a different location. Drones within the swarm may serve different roles based on their different capabilities. Attack drones carry out strikes against targets, while sensor drones collect information about the environment to inform other drones, and communication drones ensure the integrity of inter-swarm communication. Small sensor drones can provide reconnaissance for larger attack drones, gathering information on adversary targets and relaying it to attack drones to carry out strikes. Even the drones specifically tasked with conducting attacks can be diverse. A drone swarm could incorporate attack drones of different sizes, optimized for different types of targets. A swarm intended to suppress enemy air defenses could include drones equipped with anti-radiation missiles for defeating ground-based defenses, while other drones might be armed with air-to-air missiles for countering adversary aircraft. Cheap dummy drones might actually prove to be disproportionately valuable contributors to a swarm’s mission, absorbing attacks to protect more sophisticated drones or separating from the main swarm to draw away defenders. But the key here is that diversity enables more complex behaviors. Customizable drone swarms offer flexibility to commanders, enabling them to add or remove drones as needed. This requires common standards for inter-drone communication, so that new drones can easily be added to the swarm. Similarly, the swarm must be able to adapt to the removal of drone, either intentionally or through hostile action. Customization also allows commanders to adapt the swarm to the needs of a situation. For missions demanding a smaller profile, a commander may remove drones. A commander may also vary the capabilities of the swarm itself, adding drones equipped with different types of sensors, weapons, or other payloads. At the extreme end, a customizable drone swarm could break-apart or merge together into a single unit while in the field. This would enable rapid response to changing battlefield dynamics. For example, a small group of undersea drones could break off from the larger mass to investigate a possible adversary vessel. If the new target presents a significant threat, the full swarm may re-form to tackle the challenge. Research on drone swarm customization shows the concept is possible, but development is still in the early stages. A recent study in the scientific journal Nature demonstrated a basic mergeable robotic nervous system. A handful of very simple robots merge together to form a single, larger robot, or separate into smaller groups. In the future, providing commanders with a drone swarm could be akin to providing a box of Legos. Commanders may be given a collection of drones that can be combined in different ways as the mission demands. This enables rapid responsiveness to changes in the military environment. Drone swarming creates significant vulnerabilities to electronic warfare; protecting against this vulnerability is critical. Drone swarm functioning inherently depends on the ability of the drones to communicate with another. If the drones cannot share information due to jamming, the drone swarm cannot function as a coherent whole. Vulnerabilities to electronic warfare depend on the composition of the drone swarm. Swarms may incorporate drones specifically designed to counter jamming. Communication drones could serve as relays to share information, provide alternate communication channels, or simply detect possible jamming and issue retreat orders. Drone swarms could also incorporate drones equipped with anti-radiation missiles and other anti-jamming weapons. Advances in technology may also harden the swarm against electronic warfare vulnerabilities. Novel forms of communication may weaken or entirely eliminate those vulnerabilities. For example, drone swarms could communicate on the basis of stigmergy. Stigmergy is an indirect form of communication used by ants and other swarming insects. If an ant identifies a food source, it leaves pheromones for future ants to find. If the next ant also finds food there, it leaves its own pheromones, creating a stronger concentration to draw even more. Applied to a drone swarm, an approach like this that uses environmental cues could mitigate vulnerabilities to jamming. Developing drone swarm technology is a multi-service, interagency challenge. Drone swarms offer significant capability for the US Navy in searching for submarines or serving as surface weapons platforms. 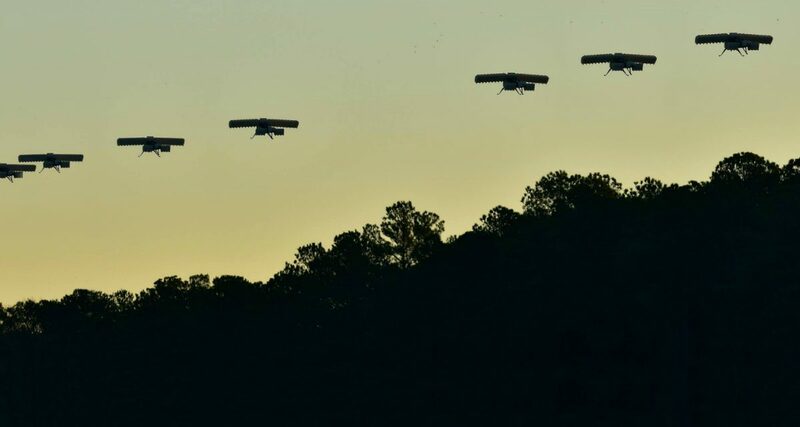 The Navy is already developing a basic autonomous boat swarm capability, and the US Marine Corps has successfully tested small swarms for infantry to carry out strikes and electronic warfare attacks. Drone swarms offer the US Air Force a novel platform for operations to suppress enemy air defenses, and Greg Zacharias, former chief scientist of the Air Force, believes future F-35 pilots will incorporate information collected from drone swarms. Robotic collaboration could improve the Department of Homeland Security’s ability to detect CBRN usages and map disaster impacts. But for all of these actors and all of these missions, truly unlocking the swarm’s potential will require US military stakeholders to deliberately emphasize improvements in four key areas: size, diversity, customization, and hardening. Failure to do so will mean being on the wrong side of the power of the swarm. Zachary Kallenborn is the lead author with Philipp Bleek of “Swarming Destruction: Drone Swarms and Chemical, Biological, Radiological, and Nuclear (CBRN) Weapons” forthcoming in The Nonproliferation Review. The article rigorously analyzes these and other applications of drone swarms. Zachary is a freelance researcher at the National Defense University, where he is conducting a study on emerging technology and CBRN terrorism and is also an analyst at the Cadmus Group where he writes, edits, and analyzes FEMA doctrine. The views expressed are those of the author and do not reflect the official position of the United States Military Academy, Department of the Army, Department of Defense, or any of the author’s current or past employers or funders.